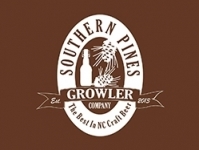 Southern Pines Growler Company is Moore County’s first dedicated, single purpose growler fill station. Our primary focus is on craft beer and the growler experience. We emphasize the best craft beers from North Carolina’s own brewery’s , and, then a mix of highly rated national and international beers. We provide a dedicated place where fresh craft beer is sold in a distinctive package, at a competitive price and in an environmentally friendly way. We constantly update our offerings to bring Southern Pines the finest selection of craft beer available.